By Bogna Haponiuk and Magda Borzucka. How to calculate enterprise value? Enterprise value calculator is a tool that helps you calculate enterprise value (EV in short) - a measure of a company's total value. In this article, we will explain the overall concept, elaborate on the enterprise value formula and provide a simple example of how to calculate the enterprise value. Additionally, we will compare this method of company valuation with market capitalization and clarify when to apply each of them. 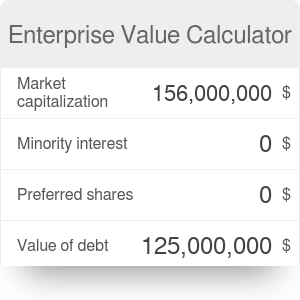 Enterprise value measures a total value of a given company, considering its market capitalization, debt, minority interest, and preferred shares decreased by total cash of a company. It is often treated as a theoretical purchase price for the whole company. Enterprise value is based on market capitalization, which is the number of outstanding shares multiplied by their price. EV is said to be more accurate, as it gives us a broader view - for example because it includes debts. A potential buyer must be prepared to pay off the company's debt in the case of an acquisition, so it is an important point when it comes to deciding whether to buy a given company. Enterprise value also includes cash and cash equivalents - in the case of an acquisition, the purchaser can directly take over this sum to cover the debts. This is why cash is deducted from the total price. Enterprise value is further used in another indicator - EBITDA multiple, which compares the theoretical market value of the company to its operating earnings. The formula for enterprise value consists of several components. Unlike market capitalization, it takes into account other sources of value than shares. Market capitalization - the market value of the whole range of outstanding shares a company has. Minority interest - less than 50% of subsidiary's equity owned by an investor or other company. Preferred shares - one of two main types of stock, besides common stock. Preferred stock is firmer but usually less profitable, and the shareholders generally do not have the voting rights; however, they have a claim to the company's assets and receive their dividends before common shareholders do. Debt - it's simply the amount of debt that needs to be absorbed by the purchaser. Cash and cash equivalents - owned by the acquired company. In most cases, companies will not have any minority interest or preferred shares. We will assume these values are equal to zero. If the company was to be bought, the acquirer should spend over $300M in total, but the $50M in cash can be used to pay off the debt. The numbers are entirely different from the market capitalization! As you can see in the example above, enterprise value should be used primarily in the case of heavily indebted companies. If the enterprise you're planning to purchase has a relatively low debt and not much operating cash, you can simply use market capitalization instead. Bogna Haponiuk and Magda Borzucka. Enterprise Value Calculator can be embedded on your website to enrich the content you wrote and make it easier for your visitors to understand your message.